We're improving how invitation forwarding works in Google Calendar. Now, if guests of a Calendar event have been granted permission to invite others, recipients of forwarded invitation emails can RSVP to the event. This will also then add them to the event as a guest. With this feature, guests of an event can now simply forward their invitation to allow others to RSVP and be added to the Calendar event. 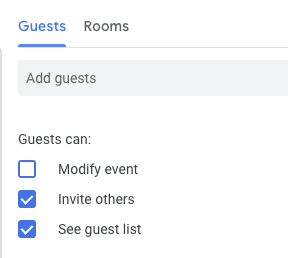 This eliminates the step of having to go into the event in Calendar to invite additional guests. End users: Simply forward your Calendar invitation to the guest you’d like to add. Please note, for this feature to work, the organizer must have granted permission for guests to add other guests to the event. Rapid Release domains: Full rollout (1–3 days for feature visibility) starting on April 3, 2019.